If Willie does anything, he keeps us on our toes—not because we have to backtrack, but because he’s moving forward rapidly, and we are the ones needing to catch up! He values his independence and wants to do things on his own, which made us nervous (it still does), but he continues to surprise us. We weren’t prepared for someone so headstrong, so we found ourselves needing to retool the RighTrak program, which was fine, as we built the program with that possibility in mind. There’s no such thing as a one-size-fits-all social welfare program. Each person has different needs, desires a different result for him- or herself, and tackles goals with different intensity and different degrees of sacrifice. That means we have to go where Willie leads us. To illustrate this point, here’s one anecdote: The court ordered Willie to do 100 hours of community service over the course of 12 months. From the very beginning, we had harped on Willie to get his community service obligation out of the way. The table members thought, quite validly, that if he pressed to get all 100 hours done in a month or two, then he could focus his time on building his car washing business. We noticed right away that not having a consistent car washing schedule was having a negative impact on business. Willie didn’t want to do community service more than one day a week, and he resisted, quite emphatically, any suggestion that he do more. To Willie’s credit, his assignment involved manual labor, which is hard on the body of a nearly 60-year-old man. Eventually, though, he acquiesced and agreed to do more community service hours. Well, it didn’t last long. He might have done two community service days in one week on one or two occasions, but that was it. We didn’t understand why he couldn’t follow through with what he agreed to do. After all, he did seem to eventually come around and accept that we had his best interests at heart and accepted our recommendation. It led the table to thoughts like “Is Willie lazy?,” “Does he not trust us?,” “Is this what the rest of the year-long program is going to be like—a perpetual negotiation with a proverbial teenager?” Not at all. It turns out Willie wasn’t the problem. We were. Willie shared with us a number of stories from his childhood and adolescent days that indicated a good deal of the trouble he has gotten into has roots in a very strong desire for acceptance, resulting from abandonment as a young child. This came into play with his community service goal because when we pressured him to adopt our goal, he feared our rejection if he didn’t go along with what we said he should do. What’s more, Willie’s failure to achieve a goal we pressured him to set is no wonder. He didn’t create the goal. He didn’t believe in it. He didn’t buy into our reasons for having the goal. He didn’t have ownership in it, so it was doomed from the start. Fortunately, we learned our lesson very early on—in part, thanks to aptly timed training by the folks at Open Table—and we learned it in the context of something that, in the grand scheme of things, is relatively minor. From this experience, we developed a process for discussing Willie’s goals and, if we think a change is in his best interest, trying to affect change in them. Willie doesn’t always know what he needs or how best to accomplish something, so we’ll brainstorm with him by asking open-ended questions. If needed, we’ll gently question the wisdom of a course of action or suggest that there might be better ways to accomplish the same thing or to get a better result. At each step we explain why we’re making the suggestion and back up the explanation with facts and/or personal experience. If Willie resists, though, that’s the end of it. Rather than attack his reasoning, we make a mental note of the conversation, and if Willie winds up encountering the difficulty we fear, then we seize it as a teaching opportunity. In other words, we have to accept that he might fail, and like a bad horror film we may have to watch it happen knowing all along the pain he is about to feel. For the table, it was an important lesson about leadership and readiness for change. Here we thought that we would plunk Willie down at the beginning of the leadership process with high direction and low accountability, with him watching as we do and eventually helping as we continue to lead. But Willie didn’t want to be led. He didn’t want to be discipled—at least not in the way we were offering it. We made the mistake of assuming we had all four Cs: character, capacity, calling and chemistry. We have lots of chemistry. The table members and Willie have really bonded as an extended family, and I thank God for that. Willie has good character. He loves Jesus and wants to do the right thing, although his life experiences have shaped what “right” is a little differently than for the generally middle-class table members. Willie has tremendous capacity to be an incredible witness and perhaps even to lead others. 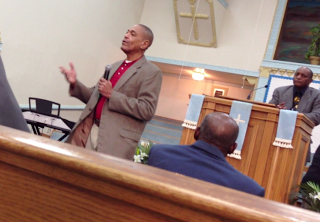 He’s even felt a calling to lead Bible studies, urban missions and a prison ministry. But there’s a part of capacity and calling that we failed to appreciate. He hasn’t felt a call to be discipled by someone else, to submit to another person’s leadership. He doesn’t have the capacity (at the moment, anyway) to follow another person’s direction because he has decided he doesn’t need to. Until he comes to the realization that he needs to be discipled, we can’t try to disciple him. My brother-in-arms, Manuel, said something to me a while back that I hope I’ll never forget. “Hold it loosely,” he said. If you can clear your mind of yourself, you’ll hear that God calls us–and indeed commands us–to do certain things with certain people at certain times. He gives us talents, shapes us and then gives us Kingdom tasks. But we have to hold those tasks loosely. If we don’t, they become our work, not His work. When that happens Psalm 135 says we will no longer see what He wants us to see, hear what He wants us to hear or breathe His Spirit on others. “Hold it loosely,” Manuel said, because we will kill it if we hold too tightly. Things don’t happen the way we want them to, and believe me I had different expectations for the first 45 days of Willie’s participation in the RighTrak program. We encountered challenges almost immediately after the luster of the initiation weekend wore off. I naively underestimated the power of our desire to do what we know–to do what we’ve done in the past–no matter how poor a decision it might be. Perhaps it’s the evil one whispering in our ear, “Do what’s comfortable. Don’t risk doing something new.” Perhaps it’s just human nature. Don’t get me wrong. We didn’t have a big backslide. It was more of a preview of what could be if we’re not vigilantly and intentionally discipling one another–that is, going through the slow, methodical process of teaching, showing, assisting and watching. Perhaps it was my first, real understanding that this is going to be hard, very hard. But here’s the kicker. If it were easy, we wouldn’t need to have faith, we wouldn’t need to rely on Him, and it wouldn’t be Kingdom work. When things don’t go the way we planned, we have a choice. Keep holding it tightly, be disappointed and try to hold it tighter in the future, or loosen the grip, recognize we are not in control, listen to what God is trying to tell us and keep working the circle. A big part of what RighTrak Industries does is promote and demonstrate missional living. Willie isn’t a project or a candidate or a client; he’s a child of God, and to many of us he’s a friend. If we are to be the hands and feet of Christ, then he’s someone we should embrace and love. This means inviting him–and others like him who might need a lot of help and support–into our regular, daily lives. The “mission” isn’t necessarily in China or Haiti or Africa, though it certainly might be. More often than not, though, the mission field is right here in our own community, and the mission is to share life experiences with people who could use some of God’s love, expressed through us. As the Building 429 song goes, “By His wounds we have been healed; and in our love He is revealed.” Enough preaching. On to the fun stuff! 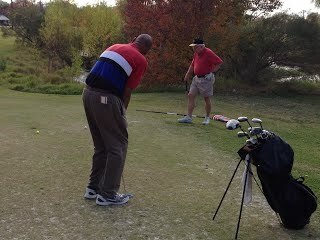 On the weekend of Thanksgiving David and his father, Lance, took Willie to a par 3 golf course and had a ball (pun intended) chipping and putting to their hearts’ content. No talk about ending poverty or making this or that change in Willie’s life–just regular ol’ talk, plus, of course, lots of unsolicited golf tips for the one hitting at the time from the other two who were not. The mosquitos were terrible, but the three of them had a good time just enjoying each other’s company. Frank has also been spending quite a lot of time with Willie. A week or so ago they went to the movies together and saw Red Dawn. The reviews from Frank and Willie were so-so. 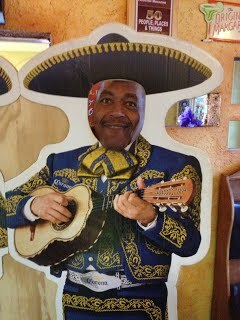 Then over the weekend Frank took Willie to lunch to a Mexican place where Willie apparently had a lot of fun as this was the picture Frank sent David from the restaurant. Frank suggested maybe Willie should give up the car washing business and join a mariachi band. It turns out, besides being a really nice, really personable guy, Willie is quite the chess player. Once a week or so Matthew will join Willie at Taft Street Coffee for a duel. We won’t embarrass Matthew with the details, but it’s safe to say he’s not won a game against Willie yet. Willie is also a rabid Texans fan, so Chelsea invited Willie to watch the Texans-Colts game with her at a BBQ tailgate party at Trinity’s early childhood center. It was a good game, but the hard labor Willie has been doing as part of his community service got the better of him, and he was nearly asleep by halftime. This isn’t about plugging a guy into a structured program someone came up with and that we all follow. It’s not about affecting change with a 10-step process and pre-defined goals. It’s about invitation. It’s about earning each other’s trust and having real, meaningful, positive relationships. At least one of the RighTrak volunteers is in contact with Willie, by text and/or phone, every single day. “How was your day, Willie.” “How are you doing?” He’s learning not only that we are here to help him (which, by the way, is a very difficult thing for someone who has lived ont he streets) but also that we want to be his friend. The challenge to be issued to Willie will come in time. Much has been and will be given to Willie, and soon much will be asked of him as well, but for now we’re just helping a friend in need. On Saturday, November 17, we had the first missional community event for RighTrak Industries. (What’s a missional community? Read about it on Wikipedia.) The event was called the Poverty to Wholeness Housewarming, and it officially started at 9:31 a.m. (refer to Matthew 9:31). Willie’s day, though, started much earlier. One of his goals was to start the first day of the rest of his life with a jog at 5:00 a.m. and a support group meeting at 6:30 a.m. By 9:00 Willie was showered, dressed and ready to entertain, having already arranged some of the furniture. Talk about ambitious! We were incredibly blessed by a few large donations of furniture, as we previously wrote about, but there were still a lot of holes to plug. Willie had literally nothing but the clothes on his back. He was starting completely anew, both figuratively and literally. 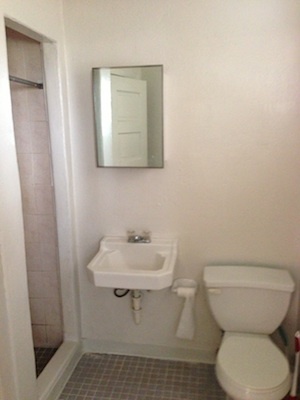 Have you ever been forced to do that before–move to a new place and start with absolutely nothing? How do you even begin to anticipate your needs? Toiletries, food provisions, socks, underwear, alarm clock, pens, paper, clothes for different temperatures and different occasions, kitchen gadgets, utensils, bus fare to get around, and on and on and on. So we issued a call to action to Ecclesia, Trinity and some West U Rotary members, and the response was impressive. People wanted not only to help Willie out with material goods, but they also wanted to meet him. Who is this man that has attracted all this attention? Why him? (Why not?) 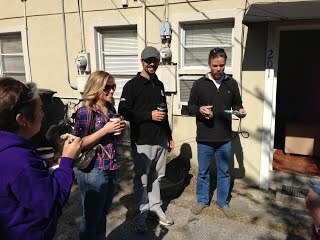 So on Saturday, after enjoying some bagels and coffee from Taft Street Coffee, a dozen or more people met at Willie’s new apartment to help him move in, welcome him to the neighborhood and show their support of his effort to begin a new life. 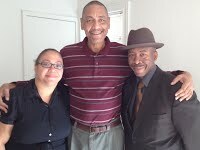 Excited about the opportunity that God has given him, Willie invited some family members to the housewarming party as well, including his niece and her husband (pictured at left). We enjoyed some great fellowship with one another and closed the housewarming party with a popcorn prayer that ended with Willie giving thanks and praying for strength to finish what he started. Willie’s ambition continued into Sunday as he attended three (three!) different church services. At 7:30, dressed in his new slacks and sport coat, he went to Mount Horeb Baptist Church in the Fourth Ward, the church where he grew up. Willie was invited to give his testimony at that service. It was an impressive testimony, and he was very well-spoken. (More on this later.) At 9:30 Willie went to Trinity Lutheran to attend its contemporary ninethirtyone service. (Willie ditched the sport coat. He didn’t want to be overdressed.) Then at 11:00 Willie went up the street to Ecclesia’s new location on Elder to attend his third service for the day, where he rekindled the friendships he had developed over the last couple years. The initiation weekend started and ended focusing on the most important thing in any kind of real, substantive transformation: our relationship with God. The first thing Willie did when he entered the program was pray for an ex-offender friend of his whose anti-schizophrenia medication wasn’t working, and the last thing he did before going to bed on Sunday was pray a prayer with his brother, Samuel, over the phone. If ever the Lord was at work, it is in this man at this time. We await with eager anticipation to see what He will do in and through him. On Friday, November 16, Willie slept under his own roof for the first time in over 6 years, having had other stints of homelessness before that. By some miracle, a member of Ecclesia contacted us about wanting to donate the essential furniture for an apartment due to his returning to the U.K., so Willie moved into a nearly fully furnished apartment! Many others answered the call to help stock the RighTrak Industries transitional housing, too: a cell phone, towels and soaps from West U Rotary Club members; gift certificates to the Sunshine Resale Shop from the West U Rotary Club; a bookshelf, socks, alarm clock, clothes, kitchen gadgets and pans from folks at Trinity Lutheran; a TV and DVD player from Ecclesia. The list goes on. The positive impact on Willie that has come from merely having a place to call home cannot be overstated. Having been relieved of the stress of finding shelter each and every night, Willie has been able to focus on his relationship with God, his plans for the future, following all the rules imposed on an ex-offender and, importantly, on not getting back into his old bad habits. Instead, he has been surrounded by loving, caring people who have made it clear they want to help support him and his success. Willie smiled so much this weekend that doubtless his face must have hurt. Willie’s initiation into the RighTrak Industries community kicked off with a spontaneous (and probably divinely arranged) lunch at Tex-Chick Puertorrican Restaurant with Frank Parrilla, proprietor of Oporto Wine Bar and Cafe and one of the RighTrak volunteers who we thought wouldn’t be able to join any of the weekend’s activities. 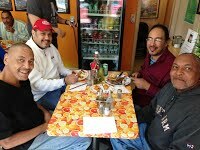 Instead, Willie and the others who joined him had a fantastic (and filling) lunch that included mofongo, a traditional Puerto Rican dish made from plantains. The group had some very deep conversation about bouncing back from the hardships of life. 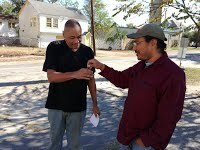 After lunch Willie and his brother, Samuel headed to Ecclesia where Manuel, Eccelsia’s homeless ministry outreach director, presented Willie with the first, tangible evidence of Willie’s new life: keys to his very own apartment! After touring the place, Samuel led the group in a wonderful prayer asking God’s blessing on Willie’s new home. 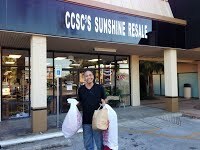 Willie didn’t have much in the way of clothes, and he wanted to get rid of the clothes that he was wearing–the last vestige of his old life–so he and David LeFevre headed to the Sunshine Resale Shop in Bellaire. Thanks to the gift certificates donated by Caring Friends, Inc. and the West U Rotary Club, Willie got some new threads, most of which were dress and business casual because Willie wanted to make sure he fit in when going to church. The evening culminated with a spaghetti dinner at Spaghetti Warehouse with other RighTrak Industries volunteers. Willie told part of his story and shared some of the struggles he’s had to endure. He also share some of his vision for the future–a prison ministry aimed at encouraging good behavior and breaking down with faith-based dialogue the feelings of inevitable recidivism and helplessness that many inmates have. (More on this to come.) Willie headed to bed, excited at the prospect of a new beginning and a new lease on life. We are so incredibly blessed by a landlord with a big heart who rented an apartment to RighTrak Industries and by generous donations from folks that enable us to pay for it! Thank you so much. A roof alone will improve Willie’s circumstances, but it would be really nice if we could do more than just provide a roof over his head. Let’s help him make him a home. Willie continues his thought- and prayer-journey as he prepares himself for some serious change. Why not help him do that in the safety and security of a real home. This isn’t just for Willie, though. 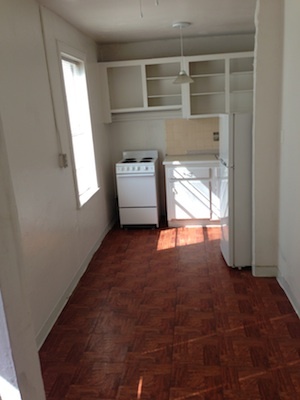 This apartment gives Ecclesia and the IDF, along with Trinity Lutheran Church, an opportunity to provide transitional housing to many other people as they participate in the RighTrak program. 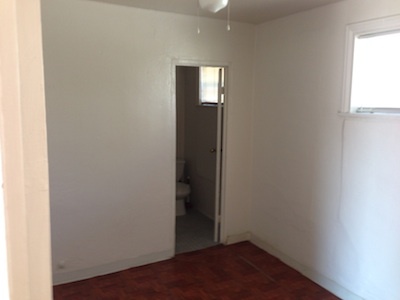 The apartment is just bare walls and a floor, and Willie (and others like him) have literally nothing, so anything you can think of to donate will be welcome. Here is a promo video for the Open Table put together by our friends at The MET Church here in Houston. It does a great job of explaining what an Open Table is and how it works. Way better than reading a 10,000-word dissertation. Check it out. Very soon after we posted about the apartment, He answered our call. Manuel’s former landlord agreed to work with Ecclesia and the IDF in the RighTrak Industries project. 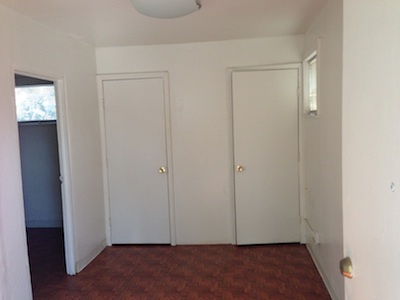 We just put down the deposit and first half-month’s rent on an apartment on the same block as Ecclesia. Willie will have a home! Oh, how important is a home. So much of our sense of security is tied to one’s having a place to call home. Honestly, I can’t imagine what it’s like to not have a home. But I’ll bet the single biggest factor that contributes to a homeless person’s crisis mentality and short-term, day-by-day thinking is the lack of security (in a Maslow’s hierarchy sense) that comes from sleeping on the streets. Doubtless that lack of security and feeling of hopelessness is a trigger for quite a few destructive behaviors and bad choices. If this RighTrak project is going to work, it will be of critical importance to keep Willie from re-entering the old life. In other words, we don’t want to lose him. That means he needs a place to stay as soon as he’s released. Here are our criteria: He will have to bike or walk everywhere, and he wants to be close to the few positive, supportive relationships he has. We want him to also be close to some social services. His church is Ecclesia at Taft and Welch. Trinity Lutheran, where Willie has expressed interest in attending also, is at Washington Avenue and Houston Avenue. Ecclesia moved most of its worship operations to Elder Street (just north of Houston Ave & Washington Ave). His car wash customers are in Montrose, and he’ll probably get more customers at Ecclesia’s Elder Street location. This Midtown/Montrose/Fourth Ward area is the target area. There are a few other restrictions imposed by the criminal justice system, but we’ll deal with those on a case-by-case basis. So if anyone has any leads on inexpensive apartments in this area, please let us know. Willie has to update his address with the court by November 15. God bless Judge Maria Jackson! She took a chance on us and on Willie. On November 16 Willie will be released into our custody. Condition number 40 (which in the Bible represents wilderness) of his release is that he participate in the RighTrak Industries program. I’m told by experienced criminal defense attorneys that of all the judges sitting on the bench in Harris County, she is the most religious and the most receptive to social programs as alternatives to locking people up. Tell me that’s not a God thing.